Well, I’ll never be accused of making the prettiest Vietnamese Summer Rolls aka Salad Rolls, but they sure taste good. I serve this appetizer as a refreshing summer time meal when I don’t feel like slaving over a hot stove. They’re super easy to make and gluten-free eaters – you can eat these! I like to serve them with both peanut sauce and sweet fish sauce. Also, sometimes I will make these with just shrimp. Sometimes, I will just use leftover chicken breast….It’s all good. The wrapping is really not difficult; think burrito and you’ll do fine. Thoroughly mix all of the ingredients together in a bowl. Done. Grind the chilies and garlic to a coarse paste in a mortar or food processor and then combine with all of the other ingredients. Mix until the sugar is dissolved. Fill a bowl (a pie pan is perfect) with lukewarm water. 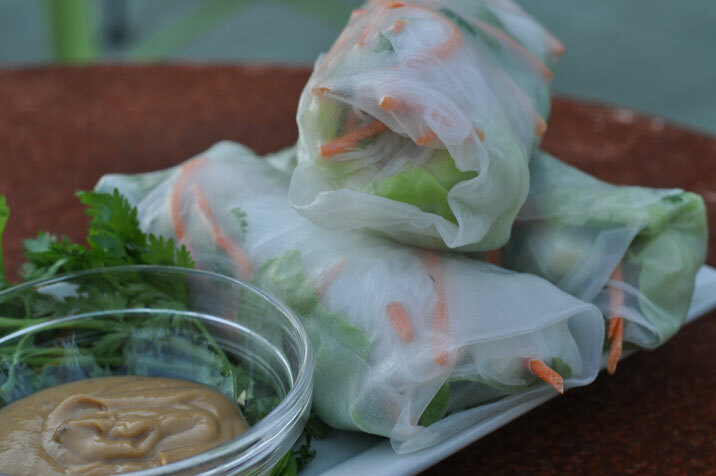 Place a rice paper wrapper in it until it is soft. Remove and place flat on a dry surface. Place a lettuce leaf onto the wrapper, closer to one edge, and top with some pork strips, rice vermicelli, cucumber, carrot and basil. Fold the closest edge of the wrapper over the filling, then fold in the sides and roll up half way. Place 2 or 3 shrimp side by side, along the roll and top with some cilantro. Then continue to roll up tightly to complete the folding. Serve with the peanut sauce and sweet fish sauce. Hi Joan! We just returned from China and we actually had these as an appetizer at a restaurant in Shanghai. They typically deep fry EVERYTHING in China – – but the spring rolls we had were done Vietnamese style very similar to this. Delicious! I’m excited to try this recipe – – the dipping sauces look fabulous!